Good Morning and Happy Thursday! 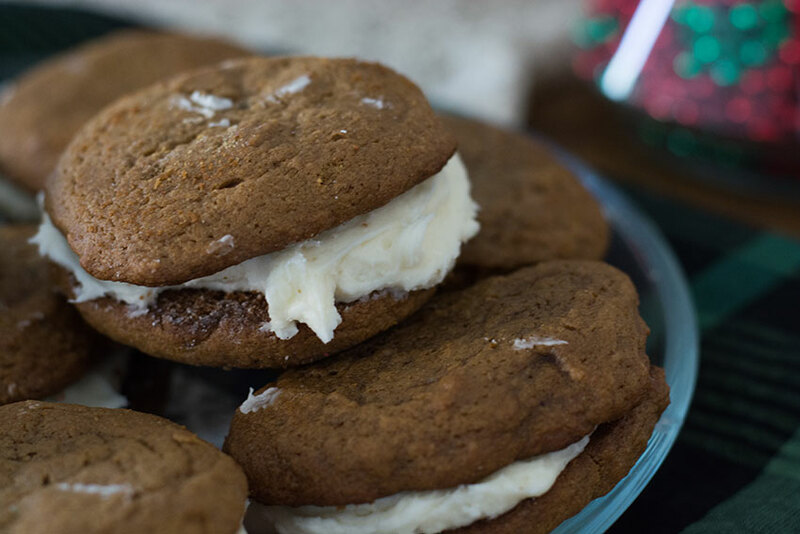 Today I decided to be a bit adventurous and make whoopie pies. 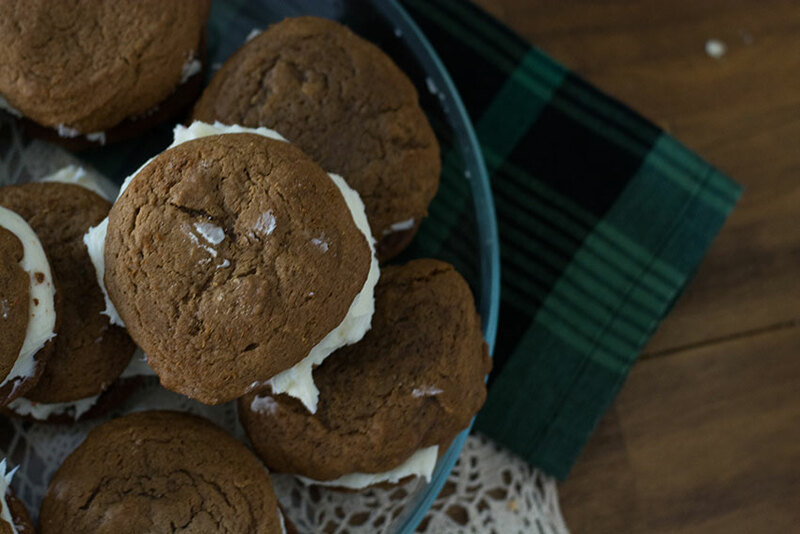 I first learned about whoopie pies through one of my favorite shows, Unique Sweets, and they were so interesting to me. 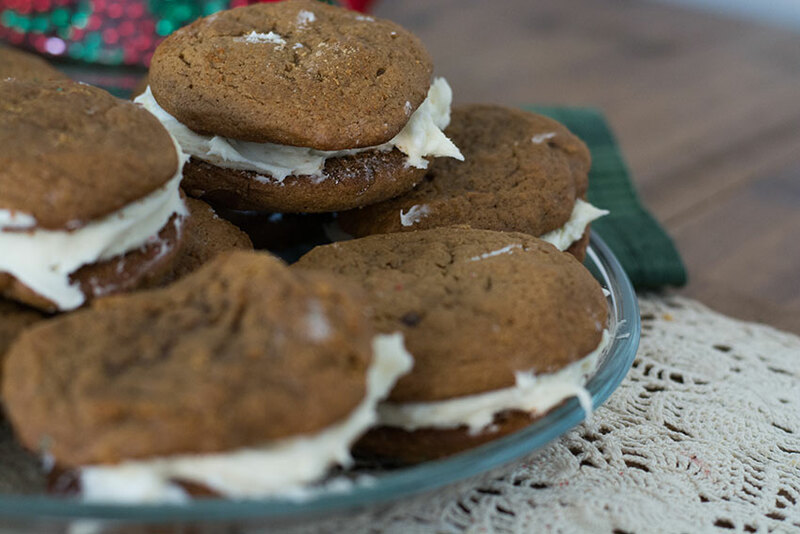 From my understanding, it’s a cake-like cookie sandwich and is easier to make than pie. 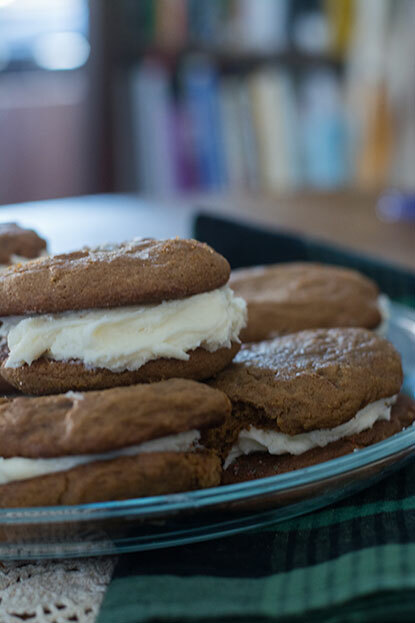 That being said, these whoopie pies were not without trial and error. The first batch I was afraid to overbake them, so I took them out at 8 minutes. The smaller ones were okay at that time, but the larger ones were a bit underdone and became a chewy cookie instead. It all thankfully worked out in the end! I had fun making something new out of classic holiday flavors while listening to new and old Christmas tunes. It’s been nice to keep up with my favorite Christmas past times as well as creating some of my own. What are you favorite Christmas traditions? Preheat oven to 375. In a large bowl, cream together butter and sugar. Mix in eggs, one at a time until they are just incorporated. Mix in the molasses and vanilla until just combined. In a medium bowl, stir the dry ingredients together. Mix the dry ingredients into the wet ingredients about halfway. Add in the milk and mix until everything just comes together. On a lined cookie sheet, scoop dough with a large spoon, making sure there is a domed top. Bake for 10-12 minutes. Let cool completely on a wire rack. In a large bowl whip together butter and cream cheese. Whip in vanilla until just incorporated. Adding the sugar 1 cup at a time, whip the mixture until you get a smooth texture, scraping down the frosting as you go. Add in milk as needed to ensure it’s easy to spread. 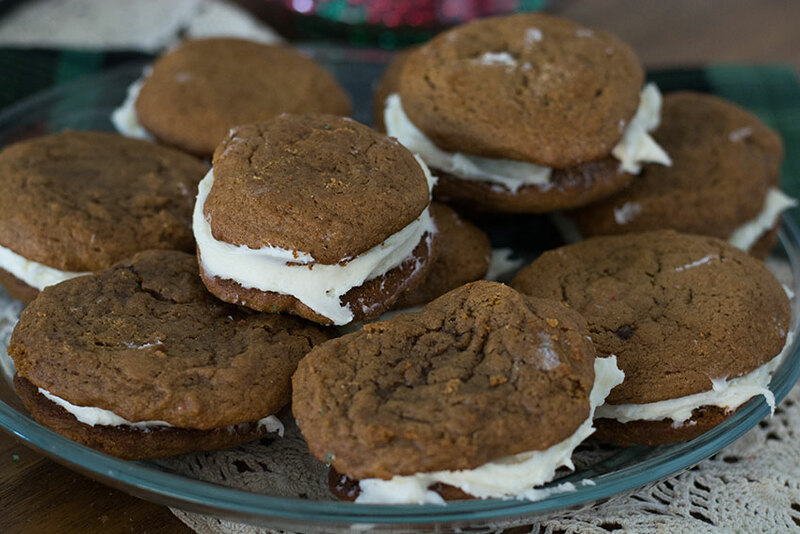 To assemble to whoopie pies, take a gob of frosting on one cookie spread it around. You can also take a ziploc bag use it as a piping bag. Make sure to squeeze the bag before piping to ensure all the air pockets are out. With that, you can squeeze from the middle to get a blob of frosting for a round edge. Top with a cookie that’s a similar size and shape.